Jeff Bezos' type of lifestyle, at least as it's presented in the book, doesn't appeal to me. It seems too much living to work rather than working to live but I enjoyed the insight. 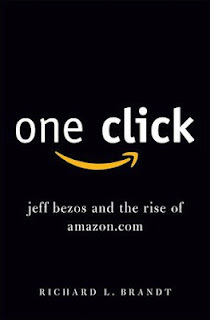 I think to do something world changing like make a company like Amazon - by definition - you can't be 'normal'. Normal people don't start companies, generally, they get a job, a house, married, have kids, watch a lot of TV and retire. One of Jeff Bezos' eccentricities in the book was to apply business methods, not just to his business but to his life - for example a decision flow chart for deciding who date! Another part that stood out had a quote about hiring, which reminded me of Valve; each person you hire should be better than previous hires and raise the bar. After a few years people who've been working there will think "I'm glad I don't have to apply now - I wouldn't be able to get it!" If you want to find out more about the Amazon book here, appropriately enough, is the amazon link.